One of my early creations and after my Kurt Angle LO this just sunk to the bottom quicker than the Titanic. The only thing I am happy with on this one is the photo and tag mat. 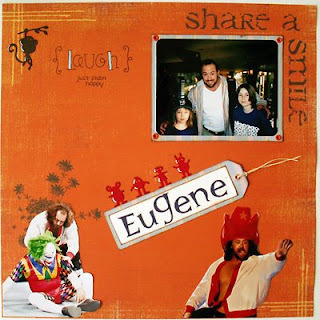 The paper (Crate) is nearly identical with the shirt Eugene is wearing on the photo. In retrospect I cpould have done so much more with it but we all have to learn from our mistakes. On this one I just thought that everything would fit in and since I hardly did not use anything except the Carolees paper for background there was nothing to fit!